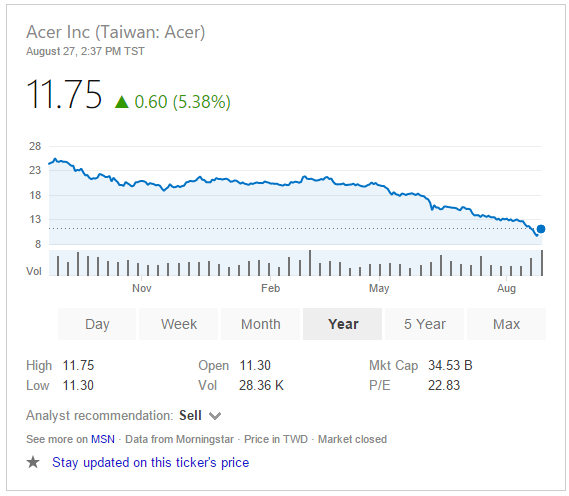 Acer's stock price has steadily declined in the past year. Is Asus a possibility for a merger? 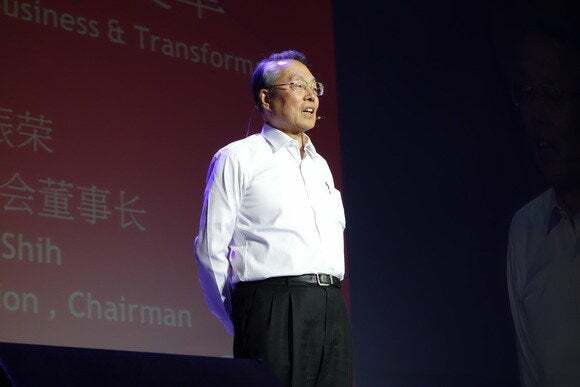 Acer would “welcome” a corporate takeover, Acer founder and honorary chairman Stan Shih said when asked whether the company was open to the possibility. Acer representatives in the United States referred comment to Acer representatives in Taiwan, who had yet to respond. Acer is still the fifth-largest PC company worldwide, selling 4.56 million PCs during the second quarter, according to Gartner. That was good enough for a 6.7 percent share of the market, down from 7.6 percent the year before. Acer, Asus and Apple are really in the second tier of worldwide PC makers from a volume perspective, following Lenovo, HP, and Dell, all of whom have over 14 percent of the market. Investors also don’t seem to be all that enthralled with Acer. Acer reported net income of NT$2 million ($79,000) for the second quarter of 2015. 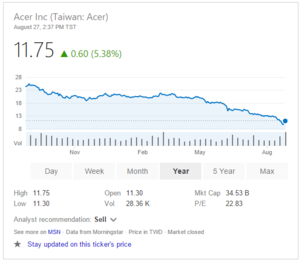 Acer’s revenue for the first six months of 2015 fell about 18 percent to NT$128.15 billion ($3.95 billion) from the previous year. But the stock price, a measure of shareholder confidence, has steadily declined over the past year. What does this mean for Acer? Right now, there aren’t many companies who would view a PC maker as a strong long-term investment. On the other hand, consolidation among PC companies is certainly a viable strategy, and fellow Taiwan PC maker Asus could conceivably merge with Acer to create a conglomerate that would, on paper, have just under the market share of Dell. That would create a Big Four of PC vendors—Lenovo, HP, Dell, and Acer/Asus—with Apple loitering nearby. What this means: Shih’s comments don’t necessarily signal that the company is up for sale, but they’re a pretty good unofficial signal that they’re at least open to talking about it. The PC is now a commodity, and not everyone can play that game and survive.